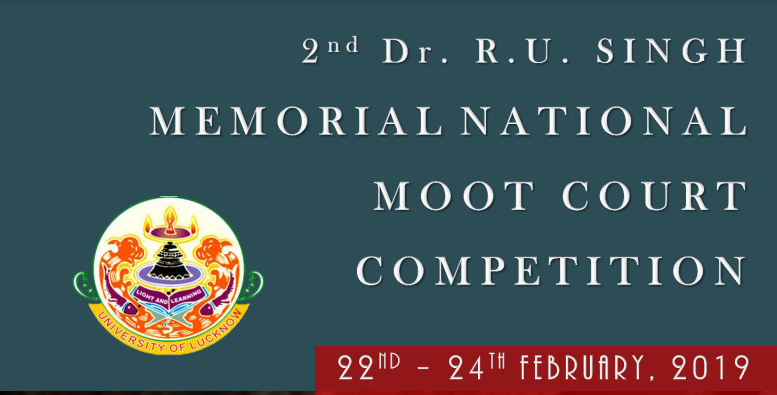 The Faculty of Law, University of Lucknow is pleased to announce the second edition of Dr. R.U.Singh Memorial National Moot Court Competition, 2019 from 22nd – 24th February 2019, aims at developing and honing the overall skills necessary for the advancement of law students, their career and growth. Students pursuing the Three or Five Year courses of the LL.B. Degree or its equivalent in the academic year 2018 – 2019 from any recognized Law School/College/University in India are eligible to participate. Any recognized Law School/College/University shall be entitled to send only 1 (one) team to the Competition. The participating team shall comprise a minimum of two and a maximum of three members. Registration fee is Rs. 4000/- (Rupees Four thousand Only) (non-refundable). The payment can be made through NEFT/ RTGS/ DEMAND DRAFT/ CHEQUE/ BT.